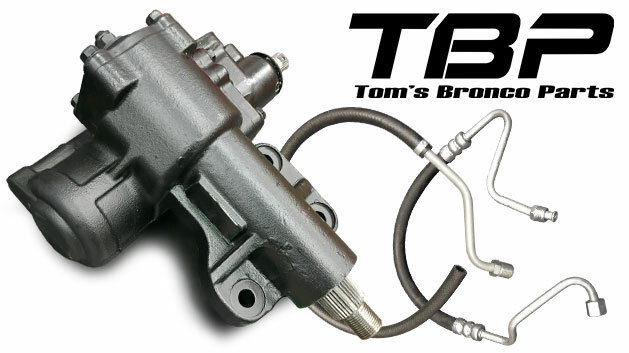 This new 3.75:1 Close ratio steering gear box is made exclusively for Tom's Bronco Parts. This box is a heavy duty replacement for your factory power steering box or can be used to convert your factory manual steering to power steering. The mounting flange of our TBP power steering gearbox is identical to the factory original mount so the three mounting holes go right into your frame. The internals of this box are larger than the original box, making them stronger and more durable. The o-ring style hoses ensure a better seal than factory hoses. This box has factory correct input and output so that the original shafts and pitman arm will install directly onto the box with no custom couplers or adapters. These boxes are made for us to our specification. Our supplier is an award winning manufacturer of OEM gearboxes. They have produced steering components for several major car manufacturers including Ford, Chrysler and others. This box is a quality piece made just for your Bronco by the industry's leading experts!